The name, Los Ciboleros, is reminiscent of the days of the Mexican and Navajo buffalo hunters on the plains of Texas. 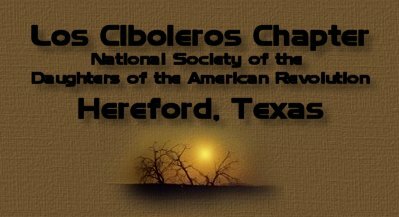 The historic Ciboleros buffalo hunters began coming into the Caprock of Texas near Norton, New Mexico, in large numbers , from 1700 to 1875. The hunters used a trail west of the Deaf Smith County line, and proceeded eastward on the ridge between Tierra Blanca and Palo Duro Creeks, straight down the ridge to Hereford. At times, the Ciboleros used the bow and arrow, but often the lance was used to quickly kill enough buffalo to supply their season's food. The National Society of the Daughters of the American Revolution is a non-profit, non-political, worldwide service organization formed in 1890, that is devoted to promoting Historic Preservation, Education, and Patriotic Endeavor. By joining DAR, you will give something back to the United States of America. It is a way to keep American and family histories alive. It gives women a straight path to conservation, education, and women's accomplishments. The DAR gives expression to the concepts of God, Home, and Country. Membership in the DAR is a unique chance to establish your lineage and heritage as a descendant of a patriot of the American Revolution. We meet the second Thursday of the month and would like the opportunity to extend membership to ladies who qualify through their patriotic heritage.